Europeans dominated at Monday’s FIFA Interactive World Cup Grand Final in New York, setting up an all-Euro semifinal on Tuesday. NEW YORK — Thirty-two of the world’s best FIFA players gathered on the 30th floor of The Skylark Hotel in New York City on Monday afternoon, playing head-to-head matches on PlayStation 4 and XboxOne while surrounded by a panoramic view of Midtown Manhattan. When the sun began to set over the towering skyscrapers, only four players—all from Europe—remained in the 2016 FIFA Interactive World Cup Grand Final. The stakes, like the level of competition, are high. The grand champion will win $20,000 and an invitation to the 2016 FIFA Ballon d’Or ceremony. Sweden’s Ivan Lapanje, France’s Dylan Bance, Denmark’s Mohamad Al-Bacha and England’s Sean Allen survived group play, then advanced through the round of 16 and quarterfinals to move on to semifinal play on Tuesday. Michael Ribeiro advanced the furthest out of any American in the competition, reaching the quarterfinals. But he bowed out to Lapanje, 2–1. Decked out in customized jerseys with their names and countries on the back, grey hoodies that read “FIWC16,” and adidas sweatpants, the contestants huddled around flat screen TVs. When they weren’t playing a match, they scouted their competition or spoke with media members from around the globe. Competitors hailed from Brazil, Burkina Faso, Denmark, England, France, Germany, Mexico and the Sudan, among other countries. The floor of The Skylark was as crowded as a New York City subway car during rush hour as players, fans and media members jockeyed for position to watch the action. The competition bears little resemblance to your average FIFA session on the couch with a friend—the tension in the room was palpable. Like the actual World Cup, the 32-player field was divided into eight groups. After a round-robin, the top two players in each group advanced. 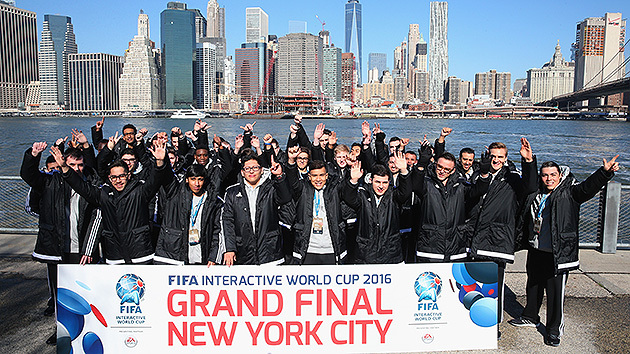 Following group play, the FIFA Interactive World Cup became a 16-player single-elimination tournament. Win and take one step toward a tournament championship, $20,000 and an invitation to the Ballon d’Or ceremony. But a knockout stage loss turns a competitor into a spectator in a matter of minutes. A three-person broadcasting team provided live analysis and conducted post-game interviews with the competitors that were projected through the Skylark’s speaker system, but there was little other background noise during group play other than the occasional gasp or cheer from the crowd. Cameras clicked and controller joysticks squeaked amidst the action. With goals came quick outbursts of pure jubilation—in the native language of the goal scorer, often indiscernible to a foreign ear. Competitors choose two teams to play with ahead of the tournament: a first choice and a backup, in case an opponent chose the same team. Players aren’t bound by their own nationalities, so Brazil and Argentina were popular selections. After a match ended, the two players would shake hands, offer a friendly “good job” or “good luck” and then sign the referee’s iPad to confirm the match score before rushing to the scoreboard to check the latest results. Even those who lost appreciated reaching the Grand Final in New York after emerging from a qualifier pool of more than two million. The final four players will square off at the Apollo Theater in Harlem for the biggest prize of all: the title of the world’s best.